So, how’s your day going? Struggling with an infestation of gremlins in your life? Echo Battery, 1st Battalion, 12th Marines, is. The artillery unit has been based at Forward Operating Base Zeebrugge in Afghanistan since May, providing protection to the Kajaki Dam, a major hydroelectric facility in northern Helmand province. 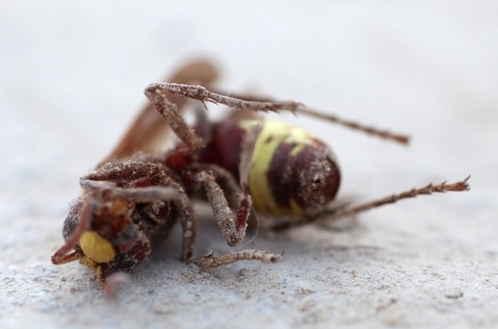 One of Zeebrugge’s more unpleasant quirks is its pests, which include oriental hornets and subterranean termites, according to a new Marine Corps news release. Insect problems are nothing new on deployment, but this one was apparently serious enough to merit attention from sailors serving in preventative medicine with II Marine Headquarters Group. Some quick Google-fu led me to this Army fact sheet, which states the hornets can grow to nearly 1.5 inches. Sounds swell. The hornets haven’t yet been introduced to the U.S., but are considered a risk to public health and agriculture, prompting inspections of military equipment, vehicles and aircraft for them, the fact sheet adds. This device really works! Just plug into an electrical outlet, no spraying …..
Hope its not too late to comment on this, Hornets are the largest eusocial wasps; some species can reach up to 5.5 cm (2.2 in) in length. The true hornets make up the genus Vespa and are distinguished from other vespines by the width of the vertex (part of the head behind the eyes), which is proportionally larger in Vespa and by the anteriorly rounded gasters (the section of the abdomen behind the wasp waist).